Røed, Maiken and Wøien Hansen, Vibeke 2018. Explaining Participation Bias in the European Commission's Online Consultations: The Struggle for Policy Gain without too Much Pain. JCMS: Journal of Common Market Studies, Vol. 56, Issue. 6, p. 1446. Kaya, Cansarp 2018. The impact of interest group diversity on legal implementation in the European Union. Journal of European Public Policy, Vol. 25, Issue. 4, p. 567. Klüver, Heike 2018. Setting the Party Agenda: Interest Groups, Voters and Issue Attention. British Journal of Political Science, p. 1. Flöthe, Linda and Rasmussen, Anne 2018. Public voices in the heavenly chorus? Group type bias and opinion representation. 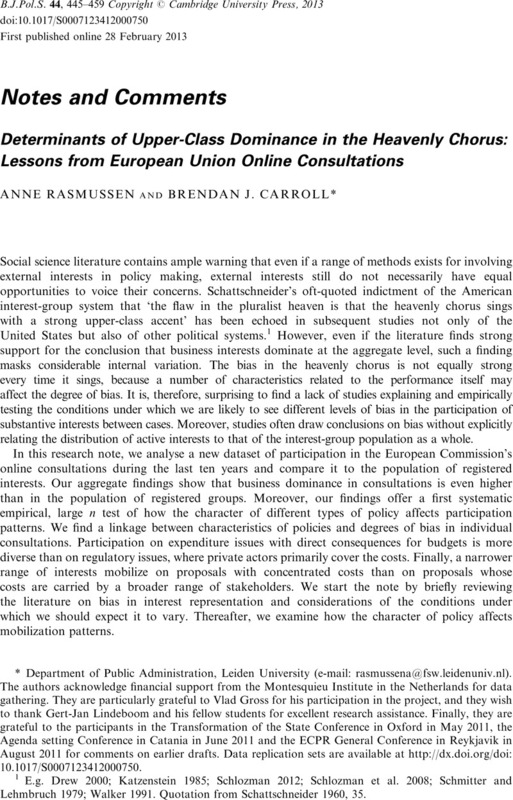 Journal of European Public Policy, p. 1. Atikcan, Ece Özlem and Chalmers, Adam William 2018. Choosing lobbying sides: the General Data Protection Regulation of the European Union. Journal of Public Policy, p. 1. Judge, Andrew and Thomson, Robert 2018. The responsiveness of legislative actors to stakeholders’ demands in the European Union. Journal of European Public Policy, p. 1. Varone, Frédéric Gava, Roy Jourdain, Charlotte Eichenberger, Steven and Mach, André 2018. Interest groups as multi-venue players. Interest Groups & Advocacy, Vol. 7, Issue. 2, p. 173. Rasmussen, Anne Mäder, Lars Kai and Reher, Stefanie 2018. With a Little Help From The People? The Role of Public Opinion in Advocacy Success. Comparative Political Studies, Vol. 51, Issue. 2, p. 139. Junk, Wiebke Marie and Rasmussen, Anne 2018. Framing by the Flock: Collective Issue Definition and Advocacy Success. Comparative Political Studies, p. 001041401878404. BUNEA, ADRIANA 2018. Legitimacy through targeted transparency? Regulatory effectiveness and sustainability of lobbying regulation in the European Union. European Journal of Political Research, Vol. 57, Issue. 2, p. 378. Berkhout, Joost Hanegraaff, Marcel and Braun, Caelesta 2017. Is the EU different? Comparing the diversity of national and EU-level systems of interest organisations. West European Politics, Vol. 40, Issue. 5, p. 1109. Bossong, Raphael 2017. Sicherheitsproduktion zwischen Staat, Markt und Zivilgesellschaft. p. 97. Marshall, David and Bernhagen, Patrick 2017. Government‒business relations in multilevel systems: the effect of conflict perception on venue choice. West European Politics, Vol. 40, Issue. 5, p. 981. Carroll, Brendan J. and Rasmussen, Anne 2017. Cultural capital and the density of organised interests lobbying the European Parliament. West European Politics, Vol. 40, Issue. 5, p. 1132.
bunea, adriana ibenskas, raimondas and s binderkrantz, anne 2017. estimating interest groups’ policy positions through content analysis: a discussion of automated and human-coding text analysis techniques applied to studies of EU lobbying. European Political Science, Vol. 16, Issue. 3, p. 337. Fuchs, Doris 2017. Windows of Opportunity for Whom? Commissioners, Access, and the Balance of Interest in European Environmental Governance. Social Sciences, Vol. 6, Issue. 3, p. 73. Young, Kevin and Pagliari, Stefano 2017. Capital united? Business unity in regulatory politics and the special place of finance. Regulation & Governance, Vol. 11, Issue. 1, p. 3. Department of Public Administration, Leiden University (e-mail: rasmussena@fsw.leidenuniv.nl). The authors acknowledge financial support from the Montesquieu Institute in the Netherlands for data gathering. They are particularly grateful to Vlad Gross for his participation in the project, and they wish to thank Gert-Jan Lindeboom and his fellow students for excellent research assistance. Finally, they are grateful to the participants in the Transformation of the State Conference in Oxford in May 2011, the Agenda setting Conference in Catania in June 2011 and the ECPR General Conference in Reykjavik in August 2011 for comments on earlier drafts. Data replication sets are available at http://dx.doi.org/doi:10.1017/S0007123412000750. ALTER-EU. 2012. Dodgy Data: Time to Fix the EU's Transparency Register. Available from http://www.alter-eu.org/sites/default/files/documents/Dodgy-data.pdf, accessed 12 August 2012. Baumgartner, Frank R, et al. 2009. Lobbying and Policy Change: Who Wins, Who Loses, and Why. Chicago: University of Chicago Press. Baumgartner, Frank R. Leech, Beth L.. 2001. Interest Niches and Policy Bandwagons: Patterns of Interest Group Involvement in National Politics. Journal of Politics 63:1191–1213. Berkhout, Joost Lowery, David. 2008. Counting Organized Interests in the European Union: A Comparison of Data Sources. Journal of European Public Policy 15:489–513. Berkhout, Joost Lowery, David. 2010. The Changing Demography of the EU Interest System since 1990. European Union Politics 11:447–461. Bozzini, Emanuela. 2007. The Role of Civil Society Organisations in Written Consultation Processes: From the European Monitoring Centre to the European Fundamental Rights Agency. Pp. 93–109 in Governance and Civil Society in the European Union, Volume 2: Exploring Policy Issues, edited by Vincent Della Sala and Carlo Ruzza. Manchester: Manchester University Press. Broscheid, Andreas Coen, David. 2007. Lobbying Activity and Fora Creation in the EU: Empirically Exploring the Nature of the Policy Good. Journal of European Public Policy 14:346–365. Chabanet, Didier, Trechsel, Alexander H. 2011. EU Member States’ Consultation with Civil Society on European Policy Matteres. EUDO Report. Available from http://cadmus.eui.eu/handle/1814/19357, accessed 12 August 2012. Drew, Elizabeth. 2000. The Corruption of American Politics: What Went Wrong and Why. Woodstock, N.Y.: The Overlook Press. European Commission. 2001. European Governance: A White Paper, COM(2001) 428 Final. Available from http://eur-lex.europa.eu/LexUriServ/LexUriServ.do?uri=CELEX:52001DC0428:EN:NOT, accessed 12 August 2012. European Commission. 2002. Communication from the Commission: Towards a Reinforced Culture of Consultation and Dialogue – General Principles and Minimum Standards for Consultation of Interested Parties by the Commission, COM(2002) 704 Final. Available from http://eur-lex.europa.eu/LexUriServ/LexUriServ.do?uri=CELEX:52002DC0704:EN:NOT, accessed 12 August 2012. European Commission. 2008. Communication from the Commission: European Transparency Initiative – a Framework for Relations with Interest Representatives (Register and Code of Conduct), COM(2008) 323 Final. Available from http://eur-lex.europa.eu/LexUriServ/LexUriServ.do?uri=CELEX:52008DC0323:EN:NOT, accessed 12 August 2012. European Commission. 2009. Communication from the Commission to the European Parliament and the Council European – Transparency Initiative: The Register of Interest Representatives, One Year after, COM(2009) 612. Available from http://eur-lex.europa.eu/LexUriServ/LexUriServ.do?uri=CELEX:52009DC0612:EN:NOT, accessed 12 August 2012. Gray, Virginia Lowery, David. 1993. The Diversity of State Interest Group Systems. Political Research Quarterly 46:81–97. Gray, Virginia Lowery, David. 1994. Interest Group System Density and Diversity: A Research Update. International Political Science Review 15:5–14. Gray, Virginia Lowery, David. 2000. The Population Ecology of Interest Representation: Lobbying Communities in the American States. Ann Arbor: University of Michigan Press. Gray, Virginia Lowery, David. 2001. The Expression of Density Dependence in State Communities of Organized Interests. American Politics Research 29:374–391. Greenwood, Justin. 2011. Interest Representation in the European Union. London: Palgrave Macmillan. Hix, Simon Høyland, Bjørn. 2011. The Political System of the European Union. London: Palgrave Macmillan. Hüller, Thorsten. 2008. Gut Beraten? Die Online-Konsultationen Der EU Kommission. Zeitschrift für Politikberatung 1:359–382. Kardasheva, Raya. 2009. Legislative Package Deals in EU Decision-Making 1999–2007. Doctoral dissertation, London School of Economics. Katzenstein, P.J. 1985. Small States in World Markets: Industrial Policy in Europe. Ithaca, N.Y.: Cornell University Press. Lowery, David Brasher, Holly. 2004. Organized Interests and American Government. New York: McGraw-Hill. Lowery, David Gray, Virginia. 2004. Bias in the Heavenly Chorus. Journal of Theoretical Politics 16:5–29. Lowi, Theodore J. 1964. Review: American Business, Public Policy, Case-Studies, and Political Theory. World Politics 16:677–715. Lowi, Theodore J. 1972. Four Systems of Policy, Politics, and Choice. Public Administration Review 32:298–310. Messer, Anne, Berghout, Joost Lowery, David. 2011. The Density of the EU Interest System: A Test of the ESA Model. British Journal of Political Science 41:161–190. OECD. 2006. Background Document on Public Consultation. Available from http://www.oecd.org/dataoecd/4/43/36785341.pdf, accessed 12 August 2012. Papke, Leslie E. Wooldridge, Jeffrey M.. 1996. Econometric Methods for Fractional Response Variables with an Application to 401 (K) Plan Participation Rates. Journal of Applied Econometrics 11:619–632. Persson, Thomas. 2007. Democratizing European Chemicals Policy: Do Consultations Favour Civil Society Participation? Journal of Civil Society 3:223–238. Quittkat, Christine. 2011. The European Commission's Online Consultations: A Success Story? Journal of Common Market Studies 49:653–674. Quittkat, Christine, Finke, Barbara. 2008. The EU Commission Consultation Regime in Opening EU-Governance to Civil Society – Gains and Challenges. Available from http://www.mzes.uni-mannheim.de/projekte/typo3/site/index.php?id=641, accessed 12 August 2012. Rasmussen, Anne, Gross, Vlad. 2012. Biased Access? Exploring Selection to the Advisority Committees of the European Commission. Paper presented at the ECPR Joint Sessions, Antwerp. Rasmussen, Anne, Toshkov, Dimiter. 2013. The Effect of Stakeholder Involvement: Consultation of External Actors and Legislative Duration. European Union Politics 14(3). Rozell, Mark J Wilcox, Clyde. 1999. Interest Groups in American Campaigns: The New Face of Electioneering. Washington, D.C.: CQ Press. Schattschneider, E.E. 1960. The Semisovereign People: A Realist's View of Democracy in America. New York: Holt, Rinehart and Winston. Schlozman, Kay Lehman. 1984. What Accent the Heavenly Chorus? Political Equality and the American Pressure System. Journal of Politics 46:1006–1032. Schlozman, Kay Lehman. 2012. Who Sings in the Heavenly Chorus? The Shape of the Organized Interest System. Pp. 425–450 in Oxford Handbook of American Political Parties and Interest Groups, edited by L. Sandy Maisel and Jeffrey M. Berry. New York: Oxford University Press. Schlozman, Kay Lehman Tierney, John T.. 1986. Organized Interests and American Democracy. New York: Harper and Row. Schlozman, Kay Lehman, et al. 2008. Who Sings in the Heavenly Chorus? Political Inequality and the Pressure System. Paper presented at the Annual Meeting of the American Political Science Association, Boston, Mass. Schmitter, Philippe C. Lehmbruch, Gerhard. 1979. Trends toward Corporatist Intermediation. London: Sage Publications. Thomas, Clive S. Hrebenar, Ronald J.. 1990. Interest Groups in the States. Pp. 123–158 in Politics in the American States, edited by Virginia Gray, Herbert Jacob, and Robert Albritton. Glenview, Ill.: Scott Foresman. Truman, David B. 1951. The Governmental Process: Political Interests and Public Opinion. New York: Alfred A. Knopf. JrWalker, Jack L.. 1991. Mobilizing Interest Groups in America: Patrons, Professions, and Social Movements. Ann Arbor: University of Michigan Press. Wilson, James Q. 1974. Political Organizations. New York: Basic Books. Wonka, Arndt, et al. 2010. Measuring the Size and Scope of the EU Interest Group Population. European Union Politics 11:463–476. Zeigler, Harmon. 1983. Interest Groups in the States. Pp. 97–132 in Politics in the American States: A Comparative Analysis, edited by Virginia Gray, Herbert Jacob, and Kenneth Nelson Vines. Boston: Little, Brown.